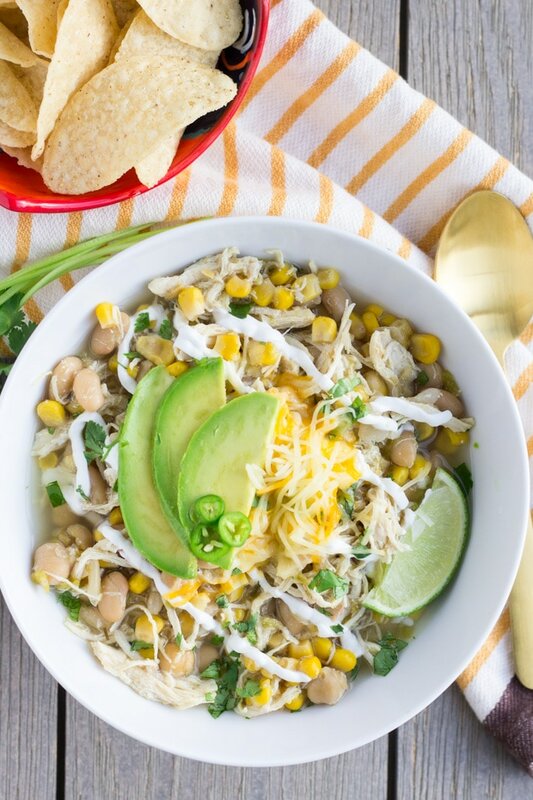 White Chicken Chili is an easy comforting chili that can be made in the instant pot or slow cooker. Customize it with your favorite toppings and serve with tortillas chips or cornbread for a meal your family will love. It’s been a busy and sleepless couple of weeks over here. We wrapped up our soccer season and now looking forward to a few summer weekend trips. Eva is going through some teething pain and resulting in less sleep for everyone. Hoping she starts feeling better soon. Since this mama has been pretty tired, I’m falling back on some easy and delicious family favorites. I love meals I can throw in the Crock Pot Instant Pot, and they don’t require any chopping or searing. 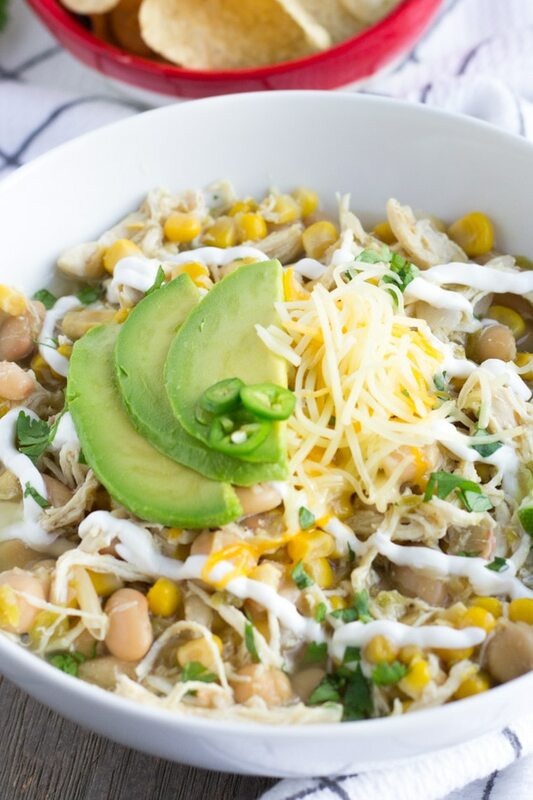 This white chicken chili fits the bill! 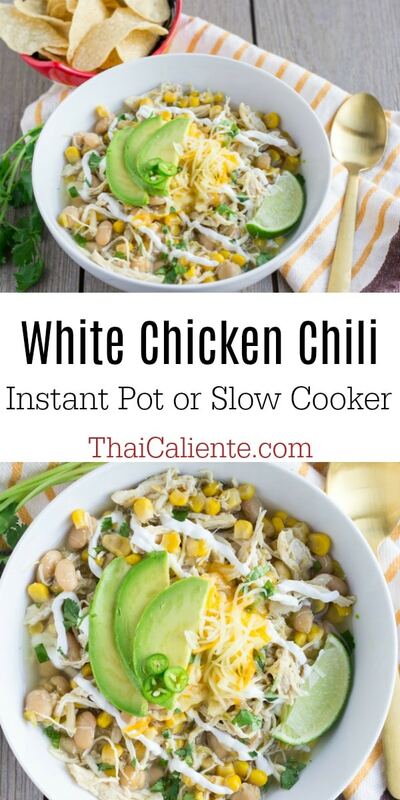 I originally posted this recipe using my slow cooker, but now I’ve converted all my slow cooker recipes to my Instant Pot. I just love that I can get the same recipe in a fraction of the time, and I personally think the Instant Pot locks in the flavor more. Plus it’s one less gadget I need to store since the IP can be a slow cooker as well, score! This chili freezes well if you want to double it and freeze the other half for another time. It’s also great for packing in thermoses for lunch the next day, or meal prep. The toppings help make this chili a nice filling meal. We like to add shredded cheese, avocado, Greek yogurt, cilantro, jalapenos, lime wedges, and scoop it with tortilla chips or cornbread. Just in case you haven’t jumped on the Instant Pot bandwagon, I’ve included instructions for both the slow cooker and instant pot. 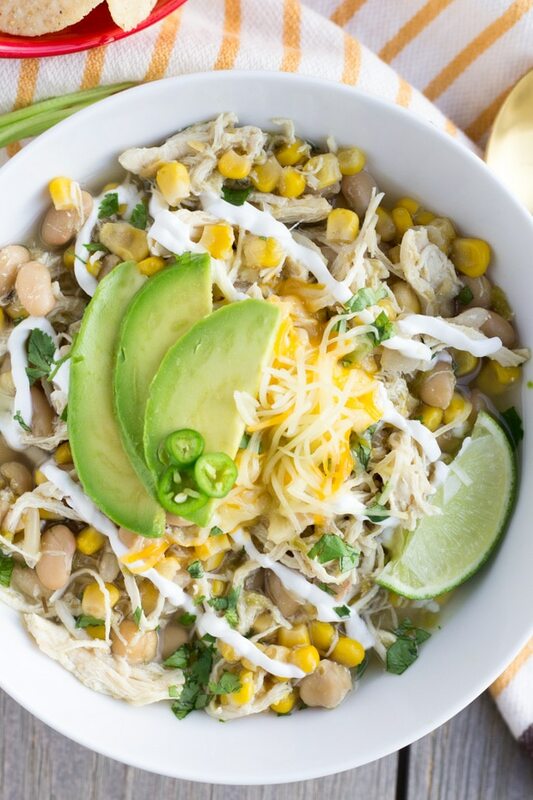 White Chicken Chili is an easy comforting chili that can be made in the instant pot or slow cooker. Customize it with your favorite toppings and serve with tortillas chips or cornbread. Place all ingredients in Instant Pot, secure lid, turn valve to sealing, cook on high pressure for 25 minutes, turn off after timer, and allow pressure to release naturally. About 15 minutes, then release valve to vent. Open lid, remove chicken breast and shred, place back into pot, stir and taste for seasoning. Serve hot with toppings. Place all ingredients in Slow Cooker in order shown. 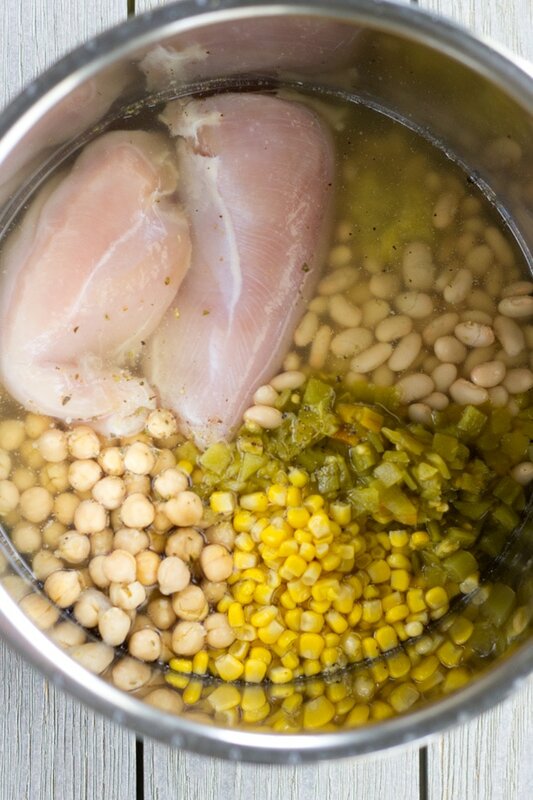 Shred chicken with a fork and stir to combine, taste for seasoning, and serve hot with toppings. This chili freezes well. Once cooled place in freezer bags or containers and freeze. Allow to thaw overnight in fridge and reheat to serve.